I have an LG Bottom Freezer French Door Refrigerator that is not cooling. I plug the refrigerator in after sitting for a few hours. Inside the refrigerator the temperature controls read 4 for both Fridge and Freezer. I hear a click and it sounds like the compressor is running. Maybe 4-5 minutes later I hear another click. I open the refrigerator doors and the temperature control is stuck on 6 and 7 on the freezer side. On the back of the fridge the condenser fan is spinning and the coil is as clean as I can get it. 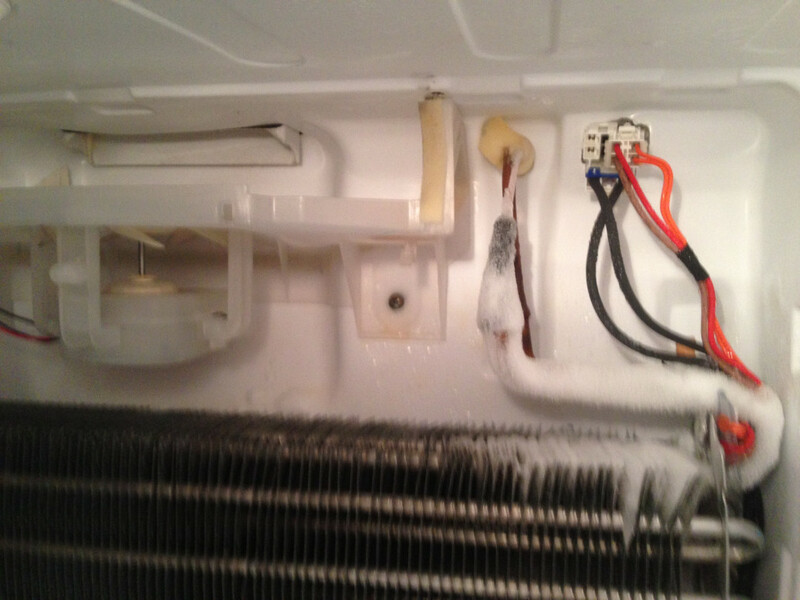 On the inside the coil is mostly dry except a small portion has ice on it as seen in the photo. The evaporator fan is not spinning when I hold door switch closed. I have swapped out the main control board because I happened to hang on to the old one because I thought it was bad the last time I had trouble, but it was only a control board fuse. If the lead of the coil is getting frosty would this having anything to do with a start relay or overload? If the relay was bad would the compressor even kick on?